Honda Activa 5G prices starts at ₹ 53,887 (Ex-Showroom) in India. 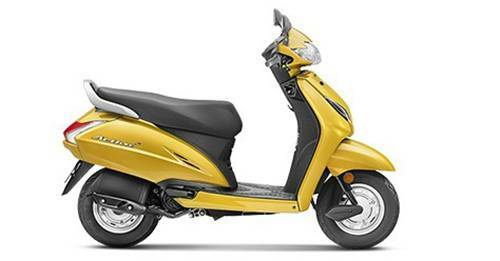 Honda Activa 5G is available in 1 variant and 8 colours. Mileage is very less in comparison to motorcycles. I think it is better to go in for a bike only as it is providing good mileage for daily use. The quality of Honda bikes is really good. All models offered are great, but Honda is pricing the two-wheelers too high I feel. The Activa 5g was first showcased at the 2018 auto expo and launched soon after. We’ll get to Activa 5G price a bit later, but before that, let’s see what are you getting if you buy Activa 5G and how it is different from the predecessor - Activa 4G. Starting off with the size, Activa 5G is pretty much the same as 4G with its dimensions being 1761*761*1158. Activa 5G sits on the same wheelbase as 4G which is 1238 mm. It gets a ground clearance of 153 mm, while fuel tank has the same capacity of 5.3 L. The total kerb weight of Activa 5G is 109 Kgs. Activa 5G specifications can’t be complete without the engine! The new 5G Activa runs on the same veteran 109.19 cc, air cooled, single cylinder, 4 stroke engine which hasn’t changed since the inception of the Activa series. The engine churns out 8bhp @7500 rpm with a torque of 9Nm @ 5500 rpm. The new Activa 5G sits on an underbone chassis with spring loaded hydraulic type suspension both at front and back. The Activa has standard drum brakes for both front and rear wheels. Front & rear tubeless tyres are same at the size of 90/100. The rim size of both alloy wheels is also the same - 10 inches. Activa 5G mileage promises around 60 Kmpl while it touches a top speed of 80 Kmph. The cosmetics for the 5G are new as it gets chrome on the front apron with two new colors. Activa 5G features include a headlamp which is now brightened by an LED setup, and so is the tail lamp. The 12V - 3Ah battery powers the instrument cluster which now has a digital display for the Dlx variant. The new 5G also gets a remote button to open the seat. The Activa 5G price launch price was ₹ 52,460 for the standard version and ₹ 54,325 for the deluxe version. The new Honda scooter comes with a 2-year warranty.